When conceptualizing an engagement photo shoot, couples and photographers usually have a hard time thinking about how to make everything in the photo session perfect. They try to choose which among the Denver engagement photo locations will suit the theme best. They think too much about what the couple will wear, how many sets there will be, and what the props are. These things are all important in making the engagement photo shoot amazing. But what makes it perfect is the display of the genuine love of the couple. When everything is all set and the photographer is ready to go, some couples find it hard to relax and enjoy the moment. Some would feel uncomfortable or overly conscious of how they look in photos. In fact, most couples are like this. Therefore, the challenge for the best photographers is to find the right words and the right way to say them to the couple so they will feel comfortable during the whole shoot. With how this couple looks in the image, you can say that they are comfortable doing the photo shoot. They look relaxed. 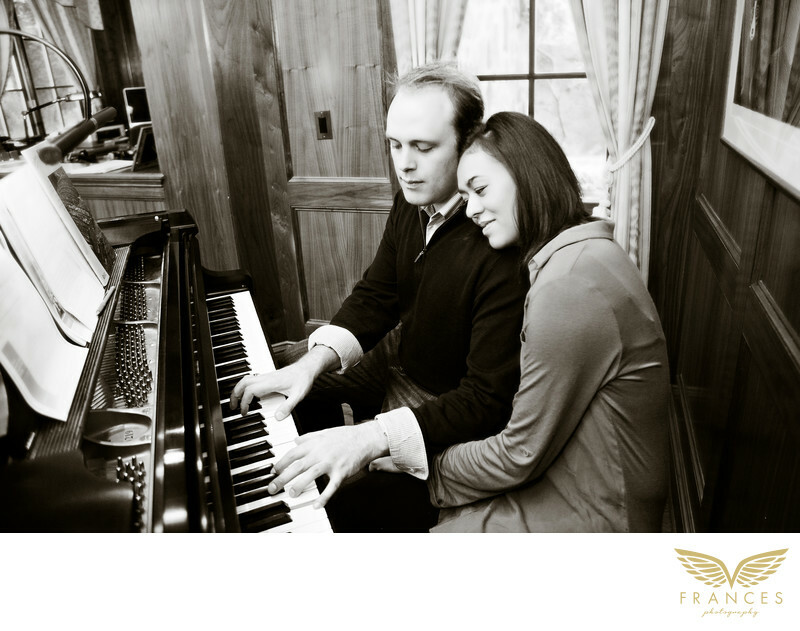 As the photographer intended to convey, it seems like the couple is just having a great time doing what they usually do - playing the piano and listening to music together.